QUẢNG NGÃI — A volunteer group of 32 members from Chung Ang University, Doosan Vina Heavy Industry company and Đà Nẵng Foreign Language University have joined the sixth annual Education Corporate Social Responsibility (CSR) programme in the central province. The programme, which began on January 11, has also drawn the participation of more than 1,000 pupils in districts of Bình Sơn, Mộ Đức and Sơn Hà for cultural exchange with Korean students from Chung Ang University. 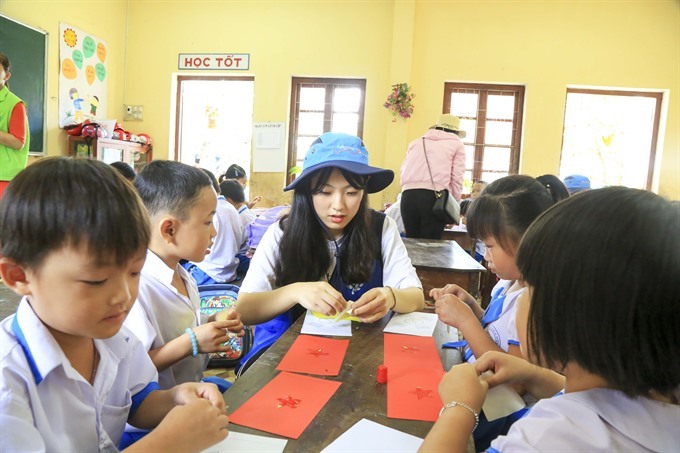 Korean students also shared their skills with Vietnamese pupils in origami, balloon modelling and pottery, while helping to clean the relic site of the Bình Hòa Massacre as well as two households in Bình Thuận Village. Students from Chung Ang University also performed K-pop, taekwondo and folk dancing. Education is one of the three key CSR programmes, together with Medical and Housing that Doosan Vina and Chung Ang University have focused on in Viet Nam over the past 11 years. Particularly, development activities like this have benefited over 5,000 students in the province. The programme will close on January 18.